Replacing an old bridge is not cheap. Although using a Paragon Bridge is very cost effective, it is still not "cheap". So, Paragon is pleased to offer clients in California the opportunity to save a little more cash by allowing Paragon to buy their old bridge! Paragon will either offer to buy the old bridge or Paragon will offer to consign the bridge. Consignments work well for clients who do not need the immediate cash as Paragon can offer a little more money for the bridge. The old bridges that Paragon receives from existing bridge owners come in all sorts of types but the most common Paragon deals with are older railroad flat cars that were converted into a bridge. Sometimes the railcars are structurally insufficient (especially cut down railroad box car bottoms) or the railcars used were structurally compromised (ie: damaged) or they are just not long enough. There is a value in most all metal pre-fabricated bridges. Their really isn't a monetary value that is offered on older stick-built bridges as the bridge will fall apart when taking it out which just leaves a pile of steel beams and/or a whole bunch of used wood beams/planks in varying degrees of size and wear. Their isn't much of a market for used steel beams as the labor needed to transport, inspect, and clean the beams then repair any defects negates any material cost savings. Most wooden pieces can be re-used by cutting them down and using them in Paragon's shop as cribbing but their is already an abundance of cribbing readily available so Paragon cannot offer to buy more. Client A sends their old bridge to Paragon. Often times, the old bridge can be hauled back to Paragon on the same truck delivering Paragon's new bridge. Paragon will then offer the bridge deck to Client B who might be interested in that bridge. Once sold to Client B, Paragon will pay Client A for their bridge. Client B pays to haul bridge to their facility. The process may take a few weeks to a year so Client A should not be in a rush to sell. Why consign? Paragon might not feel that the old bridge will sell very quickly which would tie up Paragon's cash on something that will sit too long. Regardless of how quickly the bridge deck may sell, Paragon always pays more on a consignment as tying up cash comes at a cost. We all know that re-purposing a railcar into a bridge is always a great, cost effective, and super environmentally friendly idea but think about how unbelievable GREEN and environmentally friendly it is to repurpose an already repurposed product! I believe Al Gore would be proud (somebody should let Al know about us). We are so incredibly green that TREES HUG US! Paragon Bridge Works re-purposes over a million pounds of steel every year! 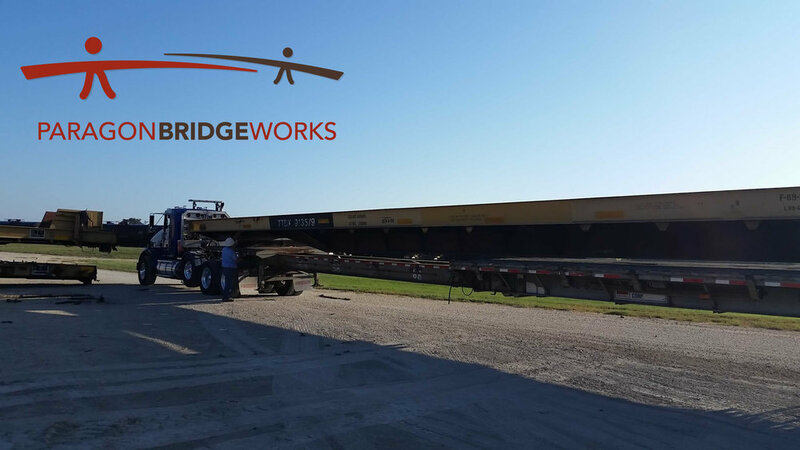 Paragon Bridge Works is pleased to announce that our first two railcars shipped out of our new distribution point in San Antonio, Texas! The railcars were brought in via railroad, moving on their own wheels, into our new distribution point where they were stripped down, cleaned up, and stored for quick delivery. Once our client called, the railcars were loaded up and hauled off right to the clients job site. We only needed a few days to line everything up. It was a quick and easy project. We have an excellent inventory of railcars in TEXAS! The San Antonio facility mostly stocks 89' railcars and some 60' railcars. Give us a call to schedule your delivery. Clean cars, fast delivery, unsurpassed experience/knowledge! The project where these railcars were delivered to needed a pretty basic bridge crossing. They needed fast, strong, and cost effective. We also provided the bearing kits which we delivered in our own company vehicle. The San Antonio facility was set up to deliver railcars for projects within Texas and neighboring states. Our freight rates are extremely competitive. While there are several ways for a crane to rig up to a railcar when setting it in place over a waterway, we will focus on one specific method: cutting windows in the deck. Symmetrical: Keep the windows evenly spaced apart from each other. Prevent crossmember damage: Do not gouge into any of the crossmembers. Better yet, stay about 1/2" away from any crossmember. Reducing the window size is better than damaging a crossmember. Ship windows with bridge: We will want to re-attach the windows after the bridge has set the railcar in place so please mark where the window goes so we can match it up later. Size matters: We need the window to be large enough to run a large chain or lifting cables through. Ideally, this is a 10" X 10" window but we can reduce that size in order to avoid any crossmember damage. It is a common practice to place multiple railcars side by side in order to achieve a wider bridge. Most of the time only two railcars are needed to achieve the desired width. However, some situations require more than two railcars wide. The widest bridge project I have been a part of was for a total of five railcars side by side for a total of 45' wide. While there are several railcar styles to choose from, this article focuses on using raised side sill railcars and a very specific challenge that these railcars pose. You will find a 3D model video comparing "raised side sill" railcars to "flush decks" at the bottom of this article. When placing two raised side sill railcars side by side, it is important to cut the inside curbs off of each railcar. It is much more practical to remove these curbs at Paragon's dismantling yard instead of waiting for the railcars to be delivered to the job site. This video covers all the basics needed when performing this task. Make sure you get written instructions so you know if you need to cut one curb off of a single railcar to two curbs off of a single railcar. Choose which curb to cut wisely. These bridge decks are bi-directional so what side of railcar the curb is removed doesn't matter since railcars can be rotated around when being installed in the field. Cut cleanly. Use 9" grinder to clean up metal slag. Take pictures when job is complete. Over achievers should watch the rest of the videos below if you want to get a better understanding. This video shows what a finished, ready to ship, product looks like with two raised side sill railcars. One notable difference is that these 89' railcars have been also cut down to 40' long. This video shows what the middle railcar looks like when three railcars are placed side by side. This other video shows what three railcars side by side look like with their curbs cut off. Ensuring the correct scope of work is critical before any parts of the railcar are removed. This video discusses the "seam cover plate" that Paragon uses to cover the gap in between the two railcars after the curbs have been cut off. And, this last 3D model video shows more of the details about "raised side sill" railcars as compared to flush deck railcars. 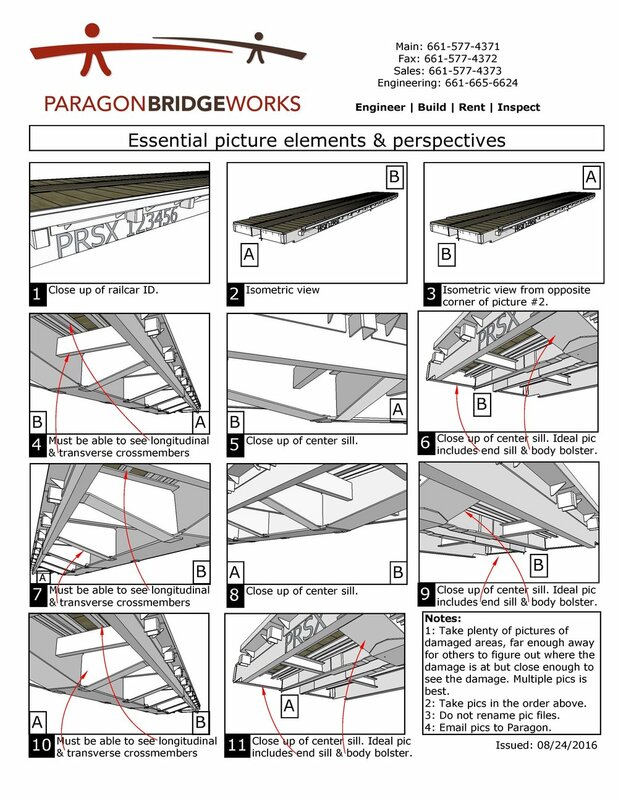 As always, feel free to contact Paragon Bridge Works with any questions/concerns you might have. We will be here when you need us. Taking the right picture is more important than taking lots of pictures. Wow, this is a PERFECT picture! Close enough to identify certain elements, like the side sill and deck condition, but far enough away to see the entire railcar. While this picture is of good quality and has good lighting it is so close up that, for most people, it loses any meaning. In my occupation I am often asked to give my expert onion on the condition or suitability of certain railroad flat cars for a bridge application. Or, I am working with a new dismantling facility that needs to show me how the railcar looks before & after it has been dismantled. No matter the reason why railcar pictures are needed, the techniques that need to be employed remain the same. This can be tough as the person taking the pictures usually has no idea what is important to me so they usually try to compensate by taking a ton of pictures of everything...except for the things I need to see. A good photo session should less than 5 minutes per railcar...and should only require about 11 pictures. It should be quick, easy, but most of all...systematic. The same sequence over and over again. Sometimes, due to poor access, it may be impossible to get the perfect picture. In those cases, take as close to a perfect picture as possible. In this example, it would have been ideal to include the longitudinal crossmembers. In this scenario, a close up of the longitudinal crossmembers were taken immediately after this picture. The condition of the railcar. The style of railcar (also known as car classification). In the video below, I explain how to take perfect pictures. Please try to get as close to a "perfect" picture as possible but I do understand that sometimes getting the camera into position is impossible. A video makes a great alternative to pictures...so long as the video quality allows me to zoom in to inspect certain elements of the railcar. After watching the video, photographers may want to download/print the PDF below that further reminds the photographer the various pictures needed. The 11 pictures outlined in the attached PDF as the minimum and more pictures are always welcomed...especially if there are anomalies, imperfections, or defects. This video will help you take the absolute best railcar pictures that will enable viewers to really see the important elements of a railcar. Alright guys, I was trying to come up with a good title to this posting because, to be honest, only nerdy structural engineers will appreciate this posting. I just created a video that discusses the subtle differences in railroad flat cars with raised side sills. These same concepts can be applied to flush deck railcars but we just happen to have several raised side sill railcars sitting around. Selecting the correct railcar style is very important and ensuring a good, matching pair is critical when building a bridge. I prefer the triple WT railcar styles as they tend to be in better condition and are less prone to defects. However, a double U railcar can be perfectly fine so long as it is in good condition. S-beams: Although these are called "standard" I-beams, they are not really "standard" any more as the W-beams are by far more common...at least in our world. They range in size from 3" tall to 24" tall. I have had to order these before and they can, technically, be ordered as an "Ibeam", such as a I12X50, which is the heaviest 12" tall beam normally made weighing 50 lbs per linear foot. J-beams: I actually just made "J-beams" up because I have actually never had to order one of these "junior" beams. I honestly do not know what these little guys are technically called. They are the least used. They range in size from 5" tall to 12" tall so they are not very small but they tend to be very thin. For example, the heaviest Jbeam, the J12X11.8, is only 11.8 lbs per linear foot. That's pretty light as compared to the heaviest comparable Wbeam, the W12X336, which comes in at 336 lbs per linear foot which is more than 28 times heavier than the heaviest J12 beam. W-beams: These are the "new standard". They come readily available in a HUGE variety of sizes and are used by far the most. These are considered a "wide flange i-beam" but the common term used in most fabrication shops is just "i-beam". Usually, the verbiage is something like "hey, have any i-beams been delivered today because I am expecting a 40' stick of W6X16". The biggest wide flange i-beam we have used is a W44X335 which came in a 40' stick weighing 13,400 lbs. That's a big beam!